The vitamin D test measures the total, D2 and D3 blood levels. What is a vitamin D blood test? The vitamin D test measures vitamin D2 and D3 blood levels. Why is a vitamin D test important? The vitamin D blood test checks for a vitamin D deficiency in the body. This Vitamin D Test is a blood test. The vitamin D test, also known as a vitamin D blood test, vitamin D lab test, D3 blood test, and a 25-hydroxy vitamin D test, measures vitamin D blood levels. Vitamin D refers to a class of steroid hormones that have a number of effects in the body. In humans, vitamin D2, also known as ergocalciferol, and vitamin D3, also known as cholecalciferol, are the most important. Vitamin D is also available from foods such as fish and eggs and can also be made into supplements. Additionally, vitamin D can also be made in the skin with the help of UVB radiation from sun exposure. Vitamin D is metabolically activated in the liver and kidney. Vitamin D is important for enabling the absorption of nutrients such as phosphate and calcium. Traditionally, certain types of people are thought to be at an increased risk for having low vitamin D levels. More specifically, people who are elderly or obese, people who have had gastrointestinal surgery, babies and people who live in areas with minimal sunlight have a higher likelihood of having low body stores. Because vitamin D plays such an important role in calcium absorption, vitamin D deficiencies can lead to bone weakness and malformation, particularly in the young and the elderly and vitamin D testing is sometimes done concurrently with calcium testing. Some research suggests that Vitamin D may also be involved with reducing cancer risk. More recent research has demonstrated that Vitamin D might play more important roles in maintaining health than previously imagined. A low Vitamin D test level might be associated with an increased risk of a heart attack, cancer, respiratory disorders and immune system dysfunction. This vitamin D test is a great measure of a body's vitamin D status. Getting a vitamin D test near you at a Quest Diagnostics lab is a relatively straightforward process. 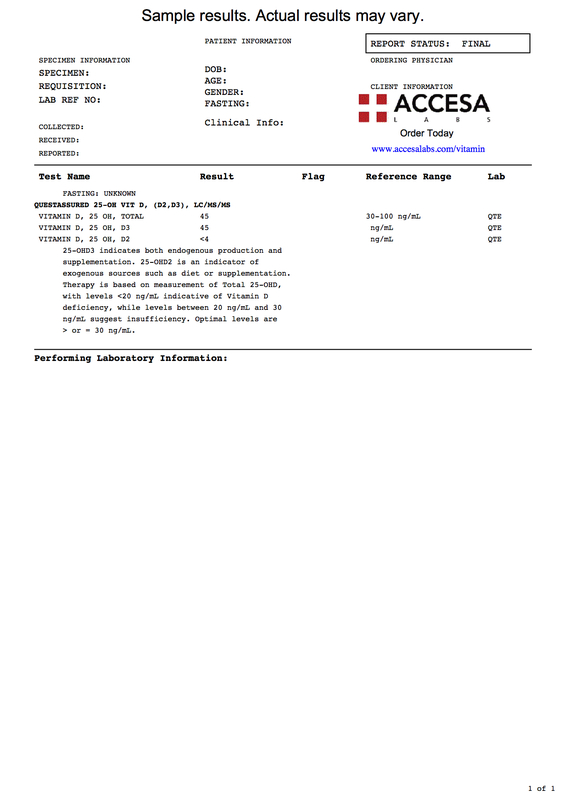 Once you order online and select your lab location, you can go the lab and have your blood drawn for the test. Every standard lab location has the necessary equipment to process a vitamin D blood test and lab results are available electronically relatively quickly. When reviewing your vitamin D lab results, the concentrations of your vitamin D 25-OH total, D2 and D3 levels will be reported in the results column. You can compare those levels to the recommended reference ranges provided by the lab to see where your vitamin D level falls. Because vitamin D can vary from person to person, it is also worth considering getting a vitamin D blood test on a regular basis to track your specific levels over time. To check additional vitamin levels while getting a vitamin D blood test, check out the advanced vitamin panel or the comprehensive vitamin & mineral panel. Vitamin D Test at Guaranteed Prices.